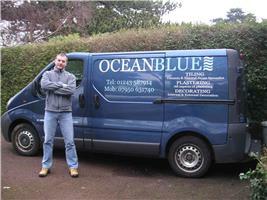 Oceanblue Tiling & Plastering Services - Plasterer, Tiler - Tiling based in Worthing, West Sussex. Invoice history based on 310 reviews. Thank you for taking time to read my page. I offer a service covering all aspects of wall and floor tiling in ceramics and natural stone, as well as plastering and decorating services, from the smallest job to complete bathroom re-fits. You will receive an honest and trustworthy service with competitive rates. My customers are shown the utmost courtesy and their properties the utmost respect.